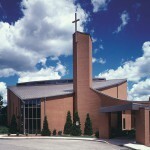 The design of this 13,000sf, 700 seat parish was a challenge to build. The angles of the walls and roof constantly needed to be verified from the axis, which was the altar at the front of the church. This verification between the different subcontractors required extensive coordination and oversight by A. Martini & Co. Throughout this project, innovative construction techniques were used to construct this “moving” building. 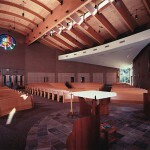 For example, the two stained glass windows at each end of the church were built into a curved wall. 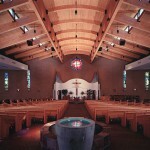 Because of the complicated design of the roof, it was fabricated on site to reduce the number of seams.